Whether you are considering installing a new conservatory or refurbishing an existing one, making the right choice about what type of conservatory roof to fit is extremely important. Poorly made, badly installed, cheap roofing can ruin the whole conservatory to the extent that the room can become “unlivable”. The wrong choices here can make your conservatory way too hot in the summer or cold and damp in the winter. So here is our ultimate guide to conservatory roof prices. Roofing options / what types of materials. Replacing an existing conservatory roof (including from glazed to solid). Features & benefits of different conservatory roof systems. The pros & cons of different types of conservatory roof. The aim is to provide a broader understanding of conservatory roofing and help homeowners decide upon the roof system that suits them best. With the first category lifestyle problems, it’s about how your current (or future) roof design impacts on your enjoyment of the conservatory as a living space. Without doubt, the 2 most common issues are the conservatory being too hot or being too cold. Usually a result of having a glass or translucent roof that offers little or no thermal insulation. Cheap quality poly-carbonate or single glazed roofs are notorious for these problems. Another issue is noise – a single glazed or thin poly-carbonate roof offers little in the way of sound insulation. When it rains the noise can be irritating enough to make the room unusable for the duration of the wet weather. A side effect of a poor roof is that of condensation. If condensation builds up significantly it can cause mold on furniture and the smell is also unpleasant. – A hot, noisy, damp conservatory is the last thing you want or need. The second category of product problems relates to specific issues with some, or all, of the existing physical roof installation itself. Broken seals and broken glass can be rectified quite quickly, but if you have a structural problem then it may not be so straightforward to repair and a full replacement is then a viable alternative. Timber conservatory roofs may have suffered rot and become weakened. UPVC frames fitted a long time ago (15yrs +) may have warped or cracked over time. The roof may no longer be weather-proof and beyond salvage physically or financially (in other words, where it costs more to fix than replace). Or, your roof could just look outdated and horrible and you want to give your conservatory a new lease of life without having to replace the whole room. Before you move on it’s worth paying attention to your local authority planning regulations. The rules regarding the percentage of a conservatory roof “translucence” were relaxed a few years ago. However, this does not completely absolve every installation of a solid style replacement conservatory roof from compliance with building regulations or planning regulations. Your chosen installer should be fully conversant with these requirements, but make sure you fully address them at outset and you know exactly “what’s what” before doing any work. Roofing options: What types of materials can I choose? Within these choices are options to use different material to do the job. Each one with its own aesthetic or financial appeal – in other words some appeal to the eye and some appeal to the wallet. Clear or translucent conservatory roofing is either glass or poly-carbonate. Poly-carbonate is a lightweight “plastic” material. Double glazed roof panels can be “performance enhanced” significantly by features such as low-emissivity coatings (low-e glass), Argon gas filled sealed units of up to 23mm in profile width. You can also use self-cleaning “solar-control” glass. Poly-carbonate roof panels offer a very cost effective alternative to glass. 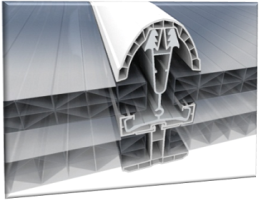 Most common profile thicknesses range from 16mm to 35mm and can be found in translucent, Opal or Bronze colours. Once more within this choice are options to use different materials to manufacture the roof. The first consideration is to have your conservatory surveyed to make sure that the existing structure can take any potential increase in weight load from using a solid roof system. Concrete tiles are extensively used for house roofing. They are good at what they do, but when they get wet they do absorb some water and therefore become heavier as a result. It should also be quite easy to get a tile design & colour that matches the ones on your main house roof. Composite Panels are beginning to get a foothold in the market. They are made from insulated GRP (the same material as in a car bumper) are lightweight, energy efficient and come in a range of colours. You can, alternate glazed sections of the roof with obscure sections to create a shaded portion to the conservatory. It could be a bit “ungainly” to do something like this with concrete tiles, but it works well with double glazed sections mixed with composite panels for the obscured sections. You could also achieve this effect on an already fully glazed roof by using an insulated uPVC (or plastered) lining on the interior underside of the roof panels. Specialist conservatory roofing companies can install an insulated uPVC “ship-lap” cladded lining in just a day or two. However, installing linings to the underside of glass has to be done properly. Poorly designed and fitted linings very often fail to take into consideration condensation forming on the inside of the covered glazing if its cold outside & hot inside. Proper ventilation needs to be built in to eliminate the chances of vapour condensation building up within the lining. If you opt for just fitting a lining in order to give your conservatory a non-transparent roof, then you should have the roof itself thoroughly checked for leaks and preferably overhauled. If your conservatory roof develops a leak in the future, it can ruin the lining. Replacing a glass or poly-carbonate conservatory roof with another translucent roof. Replacing a glass or poly-carbonate conservatory roof with a solid roof. Replacing a solid conservatory roof with a solid roof. Firstly, if you are considering replacing your conservatory roof then always get an accredited conservatory installation professional “on-site” to do a complete survey the existing roof. He or she can advise you on your options, come up with a solution and supply a detailed written quotation for the work. is usually fairly straight forward if you are replacing glass with glass or poly-carbonate with poly-carbonate, assuming that the weight loads are going to be pretty much the same. It’s typically just a matter of carefully removing the old roof and installing the new one and can take 2 to 3 days or so depending on the complexity of the original design (Victorian, Edwardian, Double-hipped etc.). Allow 4 to 8 weeks for manufacture and delivery to site. In many instances of replacing glass or translucent roofing, it is a case of choosing to replace polycarbonate conservatory roof with glass (double glazed panels). 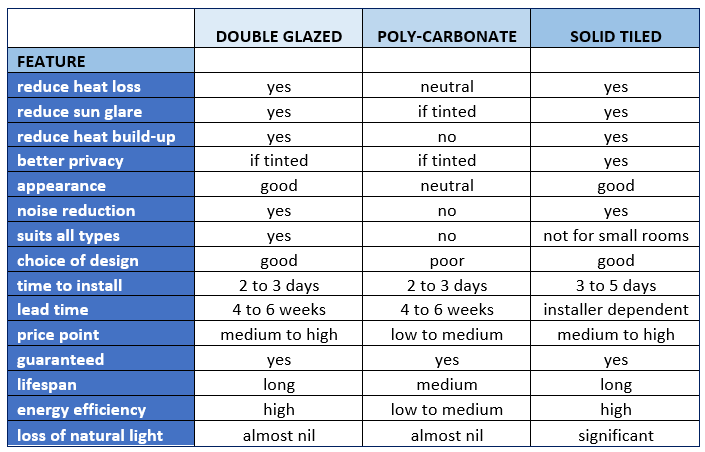 Very few installations, probably almost none, are the other way around in terms of replacing double glazed glass roofing with poly-carbonate panels. But you could replace an old single glazed roof with twin wall 35mm Poly-carbonate, which should give better insulation and UV protection than single glazing. is more complex but becoming increasingly popular. As mentioned previously, depending on the material you are planning to use, there could be a significant additional weight load and you need to establish that the existing frames can take it safely. There are many “specialist conservatory roof” companies in the market that offer tiled conservatory roofing “systems”. One aspect to consider is how you want the inside “ceiling” of the conservatory to look. You could put a flat & level ceiling in or maybe you would prefer to have it follow the original roof line. For conservatories with higher roof-lines, like Victorian, Edwardian, Georgian, Gable or Pavilion, having a flat level ceiling could lose you a lot of lovely headroom. is usually done as a result of some kind of failure of the original or because the owner wants to have a change of appearance. Solid conservatory roofs are more likely to be repaired & refurbished, rather than be completely replaced. How much do Lean to Conservatory Roofs Cost? Average Prices for Lean-to Conservatory Glass Roof. How much do Victorian Conservatory Roofs Cost? Average Prices for Victorian Conservatory Glass Roof. How much do Poly-Carbonate Lean to Conservatory Roofs Cost? Average Prices for Lean-to Conservatory Poly-carbonate Roof. How much do Poly-Carbonate Victorian Conservatory Roofs Cost? Average Prices for Victorian Conservatory Poly-carbonate Roof. How Much do Tiled Conservatory Roofs Cost? The cost of tiling a conservatory roof is so dependent on your preferences, materials used, size of the conservatory and labour, it’s no wonder that you can’t have an “average price” table. However, from our research we have come to the conclusion that you need to be thinking in terms of at least £4,000 to £7,000 for the cost of a replacement conservatory roof . You should also ask if building regulations compliance is included in the price. There are a number of specialist systems like Supalite or Guardian that provide reputable “high-end” products. 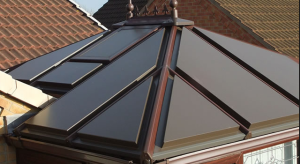 But as there are many companies in the market, our advice would be to get quotes from several suppliers so that you can have a better idea of general level of conservatory roof prices. So, which is the best type of conservatory roof? Otherwise known as: What are the pros & cons of different types of conservatory roof? This is the 64,000-dollar-question, and the answer lies with your home, your preferences and your budget. It’s not a good idea to “stick 16mm Opal coloured poly-carbonate panels” on an Orangery that cost £40,000 or £50,000 to build. Conversely, turning a 3×3 cheap lean-to conservatory into the Crystal Palace may be overdoing it a bit. Poly-carbonate panels have their place and were all the rage 10 years ago. They can work well, but have downsides when it comes to energy efficiency & noise levels, to name just two. However, they are lightweight, low cost and can last a good few years if you take care of them. Solid tiled conservatory roofs are a great way to give your conservatory a more permanent look and feel. Immediately providing great levels of insulation, noise deadening, lifespan and appearance. The only issue that many consider a drawback, is pricing, especially if you have to do additional structural work to the exiting conservatory to accommodate the new roof. A full glass roof built with good quality double glazed panels is the midpoint between the previous options (in our humble opinion). You get to keep the traditional light glass room that first attracted people to conservatories alongside all the features & benefits that modern double glazed windows offer, such as “self-cleaning” and “solar control”. How easy is it to fit a new conservatory roof? This is not a DIY job. However, a team of competent professionals can fit a simple conservatory roof in a day or two. Can you fit a replacement roof on any type of conservatory? As long as the existing wall structure is in good enough condition to support the new roof, you can fit one to any conservatory. Get a survey done first. What is a Poly-carb roof? Poly-carb is just a short way to say Poly-carbonate, which is a lightweight rigid plastic type material used for many purposes. Usually, a conservatory with a poly-carbonate roof will use twin wall sheets up to 35mm in thickness. Which is best - Tiles or slates? This is purely down to your preference. In terms of weather proofing & lifespan both of these options are well matched. Real Slate can be pricey. Synthetic slates combine appearance long life & price. How easy is it to fit a tiled roof? It’s not just about fitting a tiled roof, it’s also about removing the old one without damaging the conservatory and making sure the frame is sound enough to support the new roof. It’s not easy to do for an amateur, but a professional team can remove & install an average roof in 3 to 5 days. Can I just replace the tiles on my existing tiled roof? Yes. Just replacing the tiles is not as complex (or expensive) as replacing the whole roof. 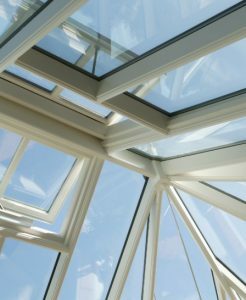 Does a glass roof suit all conservatories? The first conservatories were all glass roof designs. So a glass roof should be suitable for any type of conservatory. Is there an alternative to using glass for a "translucent" roof? The most common alternative to glass in this case, is to use polycarbonate sheeting. It is UV resistant and comes in different shades. – Opal, Bronze. Clear. What about Planning Permission & Building Control? You need to discuss this with your installer who will be conversant with the latest requirements for the product they install. Don’t start work without knowing what rules & regulations you have to comply with. What about internal linings for conservatory roofs? If you want to cut down sun glare from a glass roof you can install an internal lining. Make sure the design is one that adequately ventilates itself or you could end up with a condensation problem. What type of conservatory roof can I have? Can I fit a new roof without removing the old roof? It’s possible in certain circumstances to fit a new glazed roof over an existing one if the original can support the new weight. But why would you want to do that? What type of tiles or slates can I have? Concrete roof tiles can be used, as can “real” slate roof tiles. There are other tiling “systems” that use lightweight synthetic tiles that look great – one of these is Tapco Tiles. 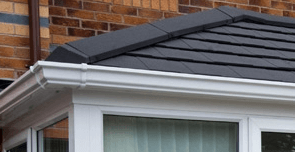 Does a tiled roof suit all conservatories? 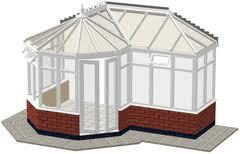 More or less yes, but small conservatories may look “top heavy” with a solid tiled roof. What type of glass roof can I have? Your options are to have 1) single, 2) double or 3) triple glazed roofing. You can also have energy efficient coated glass (low-e), self-cleaning glass, or solar control glass. You could also use “aftermarket” tinting (like tinted windows in a car!). How easy is it to fit a glass roof? It will depend on the condition of your conservatory. For an average sized conservatory (2.5m x 3m), it should take 4 to 6 weeks for your roof to be made and another 3 to 5 days to fit it. Does a Poly-carbonate roof suit all conservatories? Probably not. However, it can be used in almost any conservatory style if that’s what you want to use. Glazed panels for roofing should be capable of effective heat management. Otherwise your conservatory will become too hot or too cold. Discuss the properties of the glazing you propose to install with your contractor. Do I get any guarantees? Installers will supply a guarantee for the products and for the installation work done by them. Look for insurance backed warranties. Now that we have explained the options available, why don’t you get in touch with us so that we can arrange for a certified professional to do a free survey and recommend the most suitable solution for your conservatory.